There was once a time when man could not communicate without travel. The first development in this area was the telegraph which allowed messages to be sent over miles of wire. Starting in the late 19th century however, a few brilliant people such as Marconi discovered that electrical signals could travel through the air. The first method for embedding information in airborne signals was simply to turn them on and off in an understood pattern. The standard of the time was the same Morse Code that was used in wired telegraph systems. 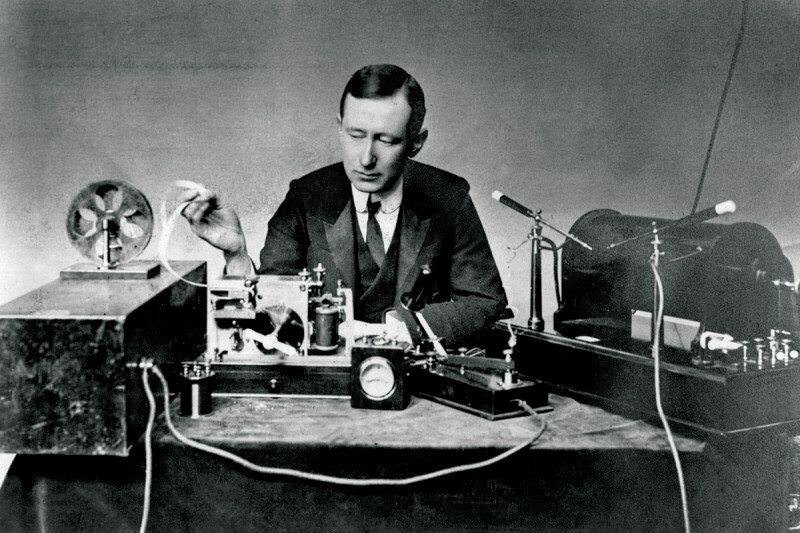 Thus before it was known as Radio, such systems were described as Wireless Telegraph. It wasn’t long before vacuum tubes were developed which allowed analog modulation. Analog simply means that the radio signal is analogous transmitted information. Or simply, the signal could be more than just on and off: it could be any value in-between. If these variable signals could correlate to varying air pressures against a microphone diaphragm for example, then sound can be sent over the air. Such systems became practical around 1920, and in less than a decade, the air was jam-packed with talk radio, music, two-way conversations, weather updates, even distance high-school and college level classes! For the first time long distance communication of was possible without travel or infrastructure. 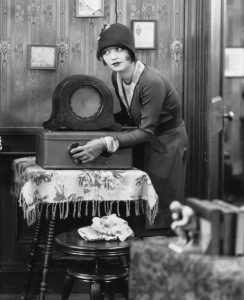 Actress Alice White in the 1928 film Show Girl accurately reproduces the intent but absent look one gets while tuning in a distant radio station. As the number of these so-called “radio stations” increased so did the chaos of frequency allocation. 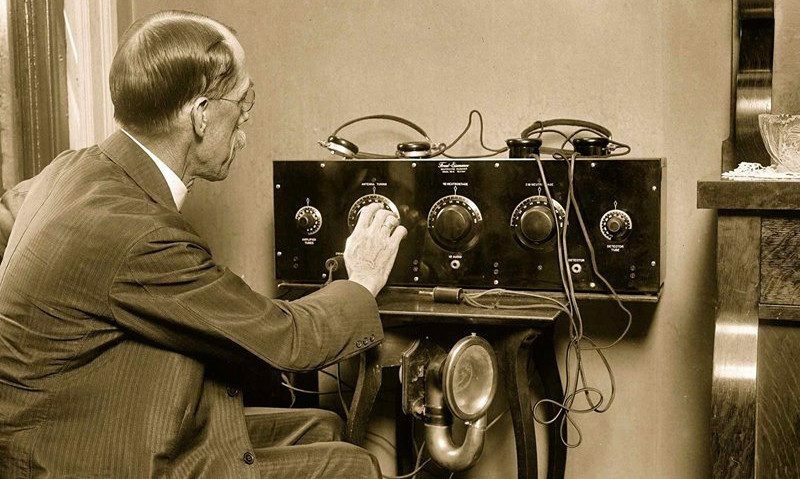 Also, as an unregulated service some broadcasters would frequently use profanity and discuss vulgar topics much to the dismay of early 20th century listeners. These unfortunate consequences of the incredible invention called for the US Federal Government to create the Radio Act in 1927. In this act radio was declared public property, and stations were required to obtain a licence to broadcast. Commercial stations – who’s goal is to make money – were separated from Amateur stations. The word Amateur is of French, Italian and Latin origins. The verb amo is one of the first words that Latin students learn and it simply means “I love.” Thus the Italian word amore, is simply love. An Amateur therefore, is someone who does what they do not for personal gain, but rather because they love to do it. To this day the category of Amateur Radio is preserved by the FCC for those who love to tinker with radio systems. There are a collection of regulations which keep Amateur operations true to this nature. Once an individual is licenced through a simple exam with published questions, free range is granted within these bounds to communicate and experiment with innumerable sorts of transmissions. 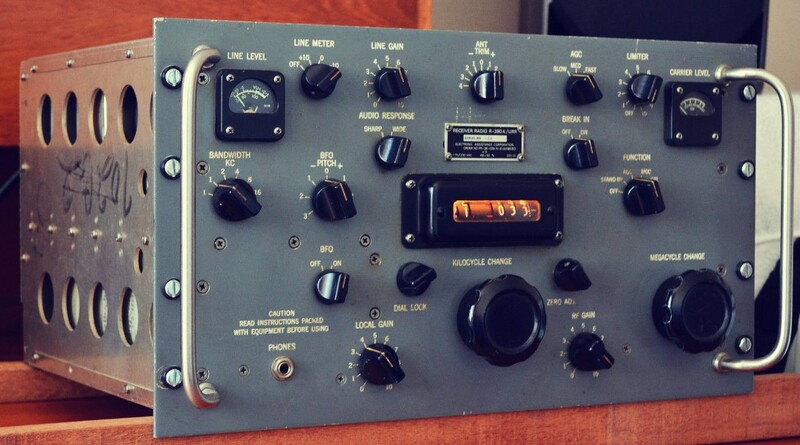 A Collins R-390A military surplus communications receiver. Such “rigs” were typical for Amateur use in the mid to late 20th century. In the years following WWII, Amateur Radio grew significantly when men and women brought their radio skills learned in the military back to civilian life. Complimenting this was an influx of military surplus equipment on the used market, making Amateur Radio cheap and approachable. 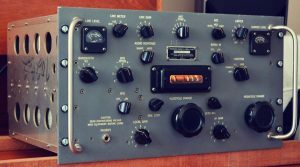 As networked communications such as cellular systems and the internet grew, they proved incredibly practical for daily communication and Amateur Radio dwindled in participation. A resurgence began in the mid 2000s however, as the novelty returned to those who did not grow up around radio. Motivations for pursuing Amateur Radio can be both utilitarian and artistic. Some of these include the science and nostalgia of this forgotten technology (my personal favorite), as well as making and talking to friends locally or across the world, emergency communications for disaster relief, position reporting networks, satellite communication, video transmissions for drones and model airplanes, and the list goes on. In the following articles we will examine radio propagation theory which discusses how signals travel and what ranges can be expected, as well as the FCC’s licencing structure, an introduction to Morse Code, modulation theory, and perhaps even antennas and various radio circuits!